It's not often I repost an image here from my Instagram feed. I try to keep the two different for those folks who are kind enough to be following through both mediums. But this week I decided to repost my Instagram collage of 2013. It's a collection of my images that got the most likes from followers during the year. Every time I look at this collection it makes me smile. I just love the colour bursting out of it and this got me thinking about the tools I use to create colour, manipulate it and change it. My absolute favourite tool of the moment is Kuler. It's an Adobe product, so it's probably more well known in the graphic design community than anywhere else, but I encourage you to go and have a look, as best of all, it's free. 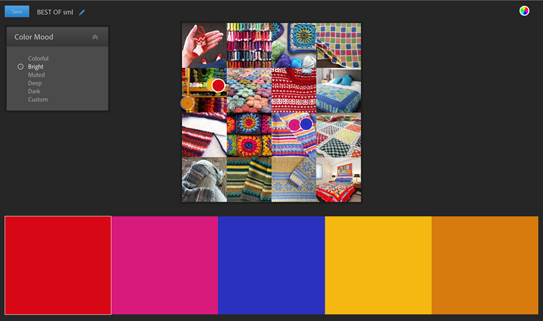 I've been using it a lot for fabric design colour combinations (and after plugging a few of the latest Spoonflower challenge colours in, I suspect they're using it too), but you could use it for choosing colours for a room, an outfit, a patchwork pattern – anything really. It's best if you create an account for yourself so you can save your colour palettes for later reference. The palette is set up so that the centre colour forms the basis of the combinations. Choose your base colour using the colour wheel, or, if you know the RGB breakdown, or HEX value then type those in. 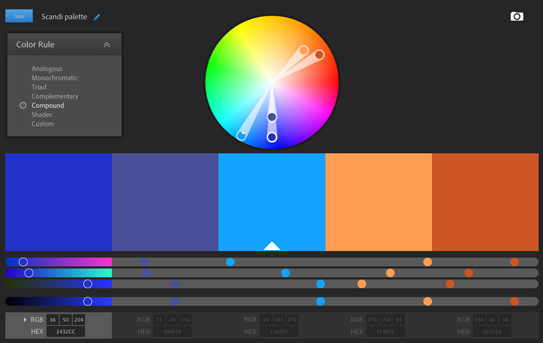 You then click on each of the colour rules on the left hand side to get a series of combinations according to various rules of colour theory. The images below show the colour combinations based on the centre blue I was using for a Scandinavian-inspired design. 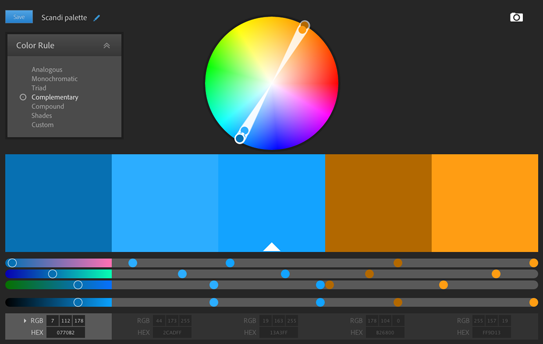 Even better, it will also create colour palettes from photographs. You might have a pic of a flower that you love the colour of, or a room you want to decorate around the colour of the walls. Just click the camera icon in the top right hand corner, choose the location of your photo file and Kuler will do the rest. 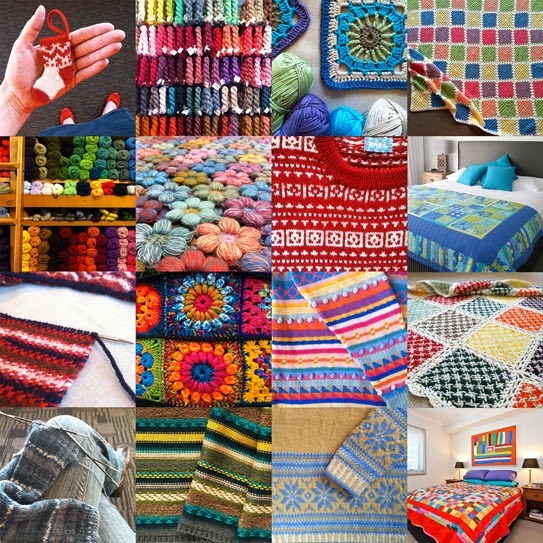 It creates mood palettes for images such as colourful, bright, muted, deep and dark. This is the 'bright' mood based on my 'best of Instagram' shot. Fantastic isn't it? I just love the internet sometimes! 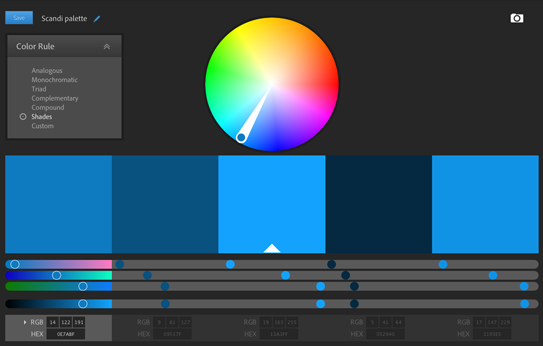 Have fun playing with Kuler and let me know of any other colour programs you use – I'm always on the look-out. PS I've taken the moderation off my comments section to make things easier. I know there's an issue with people trying to comment from iPads or iPhones, apparently it's a known problem with Safari which is the unchangeable browser on those two products... You'd think Blogger (ie Google) would have done something to fix it by now, but there you have it. One of those things I don't love about the internet.